DAF AB 9-9 is an economical polyvinyl chloride, 9x9 polyester scrim reinforced mattress ticking laminated fabric. Our standard color is light green. Custom colors are available on request with a minimum order. DAF AB 10-1 is the most economical reinforced polyvinyl chloride laminated mattress ticking fabric. The 18x9 polyester reinforcement provides greater stability. Our standard color is light green. Custom colors are available on request with a minimum order. DAF AB 10-IL is a polymeric polyvinyl chloride 18x9 polyester scrim reinforced mattress ticking laminated fabric. DAF AB 10L is more resistant to cracking due to cleaning. The standard color is tan. Custom colors are available on request with a minimum order. DAF AB Ultra-Soft Fabric is a light-weight pillow fabric. AB Ultra-Soft is a taffeta embossed film laminated to a soft non-woven backing. AB Ultra-Soft is easy to cut and sew, and an ideal candidate for the healthcare and institutional industry. The standard color is white. Custom colors are available on request. It comes in widths up to 63”. DAF CoverFab is an economical polyvinyl chloride with a reinforced polyester scrim that is used for shower curtains. CoverFab provides a fluid-proof surface which is easy to clean and yet maintains its soft and pliable hand for years of carefree service. CoverFab fabric is anti-bacterial, fluid proof, mildew resistant and easy to cut and sew. It is an ideal fabric used in hospitals, nursing homes, surgi-centers, and clinics for applications such as hospital cart, tray covers, as well as shower curtain and privacy curtains. Available in clear, white, black, light blue, navy blue, royal blue, dune, fawn, mint green, green, mauve, and red. The standard width is 72.5”. DAF RoyalTouch 870 is a nylon/PVC fabric with a 70 denier nylon taffeta fabric backed with a strong PVC film. Royal Touch 870 is easy to cut and sew. It is water resistant and flame retardant. The look, feel, and performance of this healthcare fabric is similar to the more expensive neo-butyl rubber-backed nylons but available at a fraction of the cost. DAF Royal Touch 870 comes in 58”. The standard color is navy blue. Custom colors are available on request with a minimum order. DAF Breathable 170 consists of a 70 denier nylon taffeta outer fabric coated with a thin layer of polyurethane underneath. It is breathable, but also water/moisture resistant. Breathable 170 weighs 2.0 oz per square yard. Standard colors are yellow, aqua, light blue and white. The standard width is 58”. DAF Shield protects your valuable inner mattress against potential damage caused by leakage of water vapor and body fluids through the fabric and into the mattress itself. DAF Shield is fire-resistant, antibacterial and very easy to work with. The standard color is navy blue. The standard width is 58”. Custom colors are available on request with a minimum order. DAF NoSlip is a super soft, high friction/non-skid, 2-ply with a polyester knit back. No-Slip applications are aimed at preventing mattresses, pads and cushions from sliding off their base foundations. 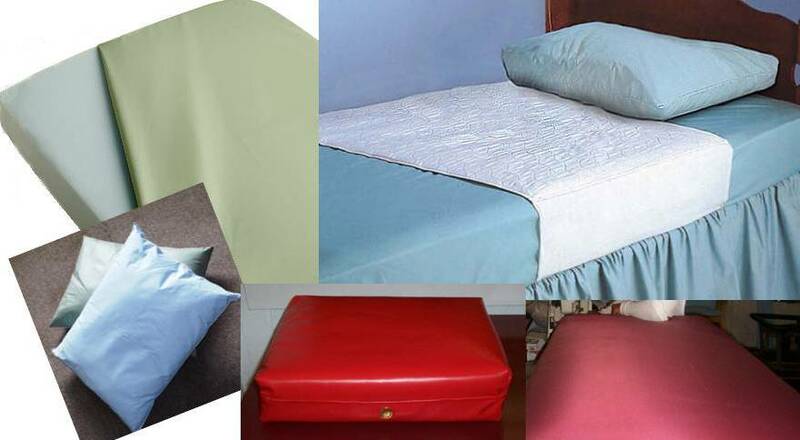 It is ideal for box spring, wheelchairs and chairs. NoSlip is easy to cut and sew and easy to handle. NoSlip is also fire resistant. The standard width is 54”. The standard color is black. Custom colors available upon request. DAF Double Polish Clear is an optically clear double-polished soft PVC film. It comes in a variety of thicknesses from .006” to .020”. The standard width is 54”. Other widths available with a minimum order. DAF 14-1 Athletic Gym Mat fabric is a three-ply 13.5 oz. fabric reinforced polyvinyl chloride made with a 9x9 polyester scrim finished with a smooth matte embossing. Standard colors are blue and yellow. Custom colors are available. Standard width is 61”.